If you have a few days in Dubrovnik, plot out 1 day for the Adriatic’s little gems, the Elaphite Islands. Taken aback by the photos in my handy “Insight Guides- Explore Dubrovnik", I knew we’d have to discover these precious little dots floating in the Adriatic sea. After getting an impression of Dubrovnik, we decided that by day 3 we’d set sail for an Elaphite islands tour. Hugging the coastline of Dubrovnik, there are 3 main islands in the chain: Koločep, Lopud and Šipan. You can book a guided full day tour with many providers, but we chose a 6 hour tour with Amico mentioned here. or the middle island. After getting picked up by our tour driver we were dropped at the Gruž harbor. We were bound to take off around 10:30am. Accompanied by a group of young Italians and two young English guys, our captain placed us on the tip of the boat. Crouch down Indian style in the shade or lounge out in the sun, the space is what you make of it. At first, my gut reaction was, "wait is this safe?" But as soon as the boat began to pick up speed, nobody was hurt in the making of this tour. We were the VIP! OK, maybe not VIP, but we had some advantages. Special treatment included an unlimited stash of white wine, cookies, and water. This is crucial for your average twenty- something-year-old. Oh! And also an unlimited local "brandy" which was actually a homemade Raki that felt like acid churning through your stomach- yuck! Our captain, Tony, talked it up sharing his sailing experiences around the world. He even had the courage to share some of the tragedies seen during the Ex-Yugoslav war. For about an hour and fifteen, we sailed and finally docked at the Lopud port and chowed down our fish lunch. You can also choose a vegetarian or meat dish option. Next, we had a 4 hour “play time” to explore the island to our heart’s desire. I was excited to discover the Šunj beach on the other side of the island. You can take a mini golf cart along the path (just 5mins to the beach) and bargain down the price to the drivers. Instead of paying 45 Kuna for 3 girls, I negotiated it down to just 20. It's a bit larger in size compared to the other islands. But we were told that Šipan is much slower-paced and rural. We didn’t have much time to explore, just a 1/2 hour, so we decided to take a few pictures by the quiet little harbor and wander up a little road away leaving the harbor. Lena found a local wine shop owned by this guy (see pic above-right). We slipped into his cool underground cellar fleeing the afternoon heat. We ended up just chatting with him for the remaining time. He was quite proud over his selection of wines and was thrilled to divulge on each other their unique flavors. He admitted that "not much happens here [on the island], but it's peaceful." Lena ended up choosing a hearty red wine. 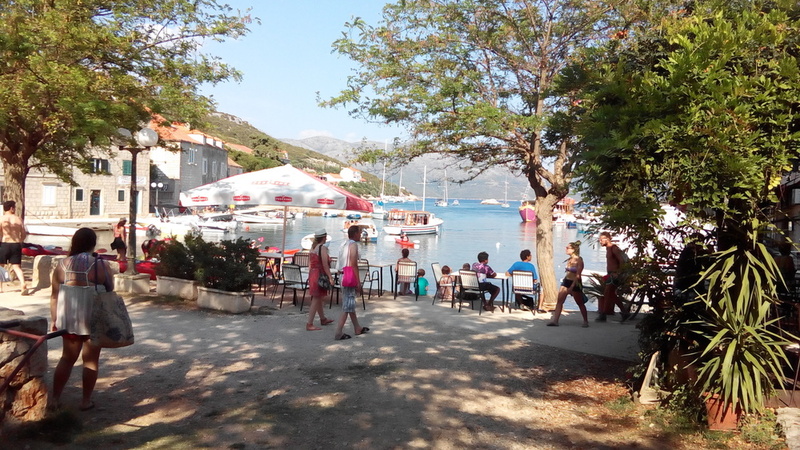 3rd island Koločep- Last stop. The last island. Make it last. We decided to take a leap off the boat. Nobody was hurt in the process. In fact, our captain joined us! I hollered with joy, "Tony's in the water!" and somehow we attracted even more bystanders to join us in the water. Only an hour left on the tour (6 hours in total for the day) Make it last. We went for a last swim and walked around the harbor taking pictures, people watching, etc. Nothing special, but honestly, these are the moments to remember. All of this for just a 250 Kuna or in Euros 33 euros. It’s worth every penny. It's been almost a year since I've left Amsterdam for a trip, so every hour and every sun ray was gratefully appreciated. I even missed my profuse sweating in the summer heat! Croatia is under-appreciated and has so much to offer the world. Nonetheless, without my girlfriends, this trip too wouldn't be even remotely as fun. Photo credits also provided by Tania @annabelledeisler and Lena @Lea.pie.